H? Paint & Quarter Horse Ranch. Owned and Opperated by Charlie & Mollie Howell. The H? 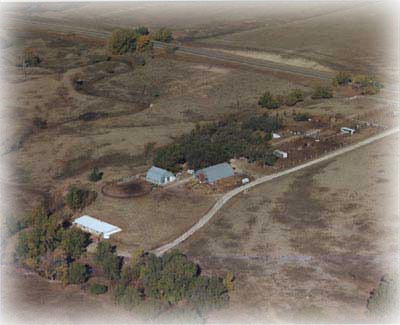 Ranch, located in the north eastern corner of the Texas panhandle, is dedicated to producing old line( foundation bred) Quarter, Paint, and Pinto performance cow horses. Our mares are of foundation, Quarter, Paint, Pinto, and Thoroughbred blood. You will also find the more familiar and modern day blood lines in some of our younger mares. Blood lines such as Joe Reed P-3, Yellow Wolf, Zanton, Midnight, King P-234, Peppy P-212, Hy Diamond, Three Bars, Hollywood Gold, Two Eyed Jacks, Cutter Bill, Clegg Bars, Zippo Pat Bars, and CowboyP-12, are present in our mare herd. Some of our mares' grandsires and great-grandsires include Joes Last, Doc Bar, Doc O Lena, Otoe, Sky Bug Bingo, Zippo Jack Bar, Gay Bar King, Feature, Zippo Pine Bar, Garver's Two, Sugar Bars, Dan's Sugar Bars, and Waggoner 101. Granddams and great-granddams include IslaTivio, Miss Ola Bar, Shov Zan, Bartons Jewel, Harts and Flowers, Miss Sen Sen, Gay Widow, Uvalde Doll, Silma Sue, Lamac Jan, and Josie Last. We also stand a nice young stallion, Otoes Heartatack "Barbone". Otoes Heartatack has Hy Diamond , Garver's Ranch, Hank H, & Waggoner Ranch blood on the top side, and Sugar Bars and Peppy blood on the bottom side. Come in and take a look around. We hope you will enjoy your visit.